From grimy trap to main-stage D&B, from delicate melodies to stupidly big basslines, from Ukraine to the UK, MaxNRG’s got it covered. Since signing to Technique he’s demonstrated a level of versatility that’s meant each new release comes with the promise of some new twist in the bass-music tale. Listen to the horror-movie darkness of Danger Zone, the electro-acid road joint Dis Way We Gotta Do It and the proudly Eastern European Arkan, and you wouldn’t even know it was the same mind at work. So what’s the story this time? Now Hear This is straight wheel-up-and-come-again material. A percussive first thirty-two establishes a base level of tension, before a textbook breakdown and build combo ramps it even further. Then a monster drop, made of battling percussive riffs and driving basslines supported by iron fist drums, provides the rave exactly what it’s been waiting for. Then Max breaks it down to show he’s still got more where that came from for the second drop. This is a mighty piece of dancefloor science and a party-hyping essential. Then, of course, it’s a different vibe for Midnight Rider. Paying homage to his roots, Max weaves balalaika samples into the rough-hewn bass and beats, giving this tune a uniquely haunting quality. This is soulful D&B done Ukrainian style, undeniably led by melody but without ever sacrificing raw dancefloor power. It’s a track with a big-room, hands-in-the-air mentality, but delivered with the subtlety that a real instrument brings to the table. 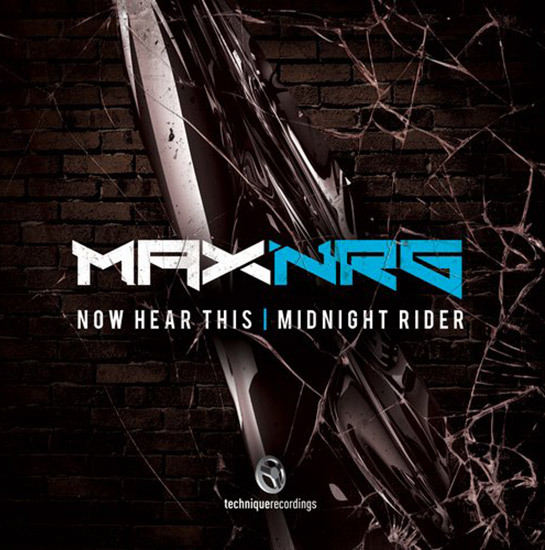 With this release, MaxNRG has shown he’s still got no interest in sticking to a formula. Constantly evolving and rewriting the rule-book as he goes, he’s capable of reliably supplying the dancefloor with weighty bass and beats while still pushing genre boundaries. Stay locked, because this journey has many more miles to go.